One more year the Group of Roma Women of the Fundación Secretariado Gitano, along with the rest of the people that form part of this entity, we join the commemoration of March 8 International Women's Day, because we still have much to achieve and because we also firmly believe that WE ARE MORE. For these reasons, we believe that on such an important day as March 8, we can not fail to express our support and commitment to defending the rights of all women and specifically to the equality of Roma women. We are aware and know that gender roles, care and work-life balance affect more intense on women, that precariousness and temporary work affect us more than men, that we live in a patriarchal society where, for different reasons, women still We do not have the same opportunities as men, nor do we have the same treatment. We are aware that we are part of a society in which violence against women and girls does not disappear, and inequality continues to affect many people. For many women, being a Roma can mean facing a road with barriers and difficulties. Still a large social majority continues to associate us with an image anchored in stereotypes that does not show our great diversity. This image presents us far from spaces and economic, social, political and cultural issues. We want to be and we are an active part of society, to contribute, to decide, in short, to contribute to the construction of a common social model for all. These stereotypes also prevent us from being seen as we want, as we really are, that is, as professionals, as students, as university students, as neighbours, as mothers with children, as single, as feminists, as teachers, as defenders of social injustice, as women against gender violence, as women who want a quality education and a non-segregated school, decent women defenders, women who say no to the glass ceiling, defenders of the right to equality and difference, etc. Because we want a more just and more egalitarian society, on a day like March 8, we can not stop denouncing the racial or ethnic discrimination that many Roma people continue to be victims of, and also many women, especially in supermarkets, in shopping centres, schools, access to decent employment, access to housing, etc. Once again prejudices and stereotypes strongly rooted in our society, prevent building a bridge of hope for a more intercultural and cohesive society. The Group of Roma Women, with this release we want to appeal and demand from all public and private authorities and responsible institutions, also society in general, to commit themselves to the reversal of all situations that involve inequalities. We ask that they be effectively and really involved in the development and implementation of appropriate measures to eradicate the causes of this inequality. We ask for the implementation of measures that promote Gender Equality of all women in employment, education, political and social participation, contemplating the reality of Roma women. For all this, and because we can not give up on the defence of rights, this March 8 we give you a thousand reasons to meet Roma women and a thousand reasons to defend the rights of all women. 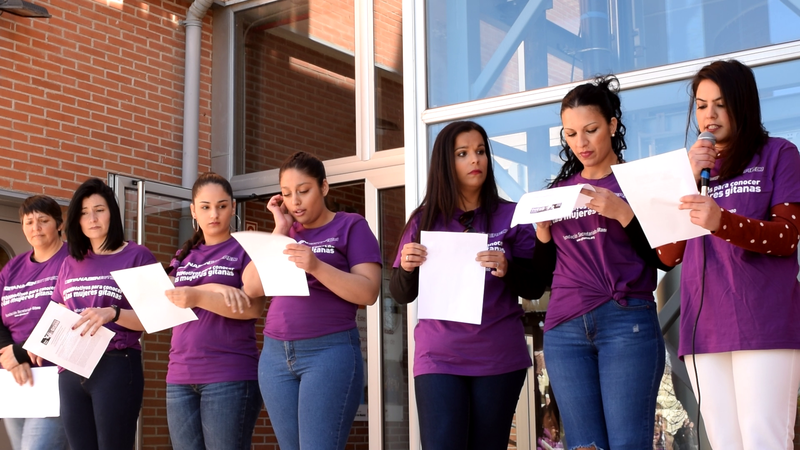 "We are women who feel, we fight and we want to achieve a real and effective equality"
Flashmob de las mujeres participantes de los programas y compañeras de trabajo de la FSG. FSG Valladolid inaugura la Exposición fotográfica :" Miradas de mujeres gitanas".